France has a lot to offer, starting with Paris. The south of France has beaches and glamor, Bordeaux glorious wine, but there are also two cities equally dynamic and second in size only to the capital. Marseille has its lively Old Port and its famous bouillabaisse fish soup, while Lyon has – everything! Located two hours south of Paris on the fast TGV rail system, Lyon is close to the Burgundy region, surrounded by vineyards, as well as top Michelin-star restaurants. Often called the gastronomic capital of France, the heart and soul of the city is a big indoor market called Les Halles (halles-de-lyon-paulbocuse.com). Here foodies will find the best of everything such as Bresse chicken, many cheeses such as the creamy, local St Marcellin and delectable cakes with almond-rich pralines. You can eat fresh oysters with a “pot” of Macon wine, and dine at any of the cozy restaurants offering traditional Lyonnais cuisine. Chez Antonin does a wonderful seafood lunch. Paul Bocuse’s name is on the market because he is the city’s most famous chef, but his Michelin 3-star restaurant (www.bocuse.com) is actually just out of town at Collonges. It was here he created his celebrated truffle soup in 1975 for a French president, and it can be yours for about 100 bucks. He has however, a string of brasseries around Lyon, and one of them L’Est, is in an old railway station. Aptly, a miniature train runs around the restaurant just below the ceiling (www.nordsudbrasseries.com). Recommended for kids of all ages! Adventurous eaters should explore the bouchon restaurants where traditional Lyonnais fare is served. I stumbled on the Le Garet (lyonresto.com) where the menu featured calf’s head and tripe. I had herring with lentils, followed by saucisson (a large, very tasty sausage) and boiled potatoes. Add a glass of Rhone wine for a meal to remember. The staff was friendly, spoke English, and it was not expensive. Not far away is Lyon’s modern art museum, the Beaux Arts, endowed with Impressionists and a charming garden, a good place to escape city crowds. In fact there is much to see and do in Lyon, anchored by the elegant Place Bellecour, and a good place to start as the tourist office (lyon-france.com) is here. One again the staff is friendly and speaks English. 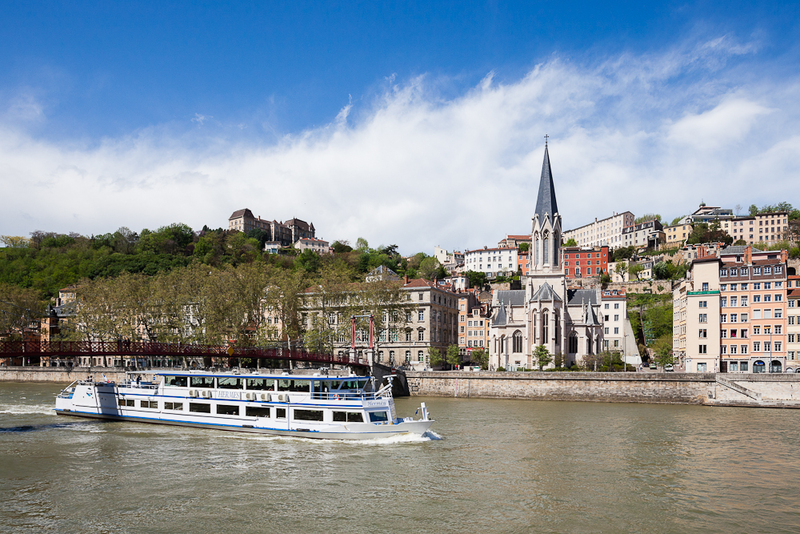 A City Card (lyoncitycard.com) is a good idea, which gets visitors on a hop on-hope off bus service (lyon.opentour.com) covering all the main attractions, including 22 museums, as well as the City Boat (lyoncityboat.com). The same company does lunch and dinner cruises on the luxury Hermes, recommended for a hot day as the vessel is beautifully air-conditioned. However there is a good-sized aft deck, partly shaded, perfect for taking photographs. There is much to see. Lyon has handsome waterside buildings and some breathtaking landmarks such as a hilltop basilica overlooking the city, whose very location at the confluence of the Rhone and Soane rivers is quite remarkable. The rivers converge just south of the city centre creating a narrow peninsula, or “presqu’ile” whose former docklands are being redeveloped as the Confluence with some striking buildings and a huge glass and steel museum that reminds the visitor of Bilbao’s Guggenheim, or Star Wars. It is a work in progress, one aimed at creating a cultural hub that will reshape Lyon, a city that was the ancient capital of Roman Gaul and later a center of the silk industry. The historic traboules, covered alleyways, where the canuts (silk weavers) worked are changing too, with emerging fashion studios and cafes. The cruise starts in the city centre, goes around the Confluence, heads north to Ile Barbe, where a monastery was founded in the 5th Century and had a library given by Charlemagne. Hermes then turns around and goes back the same way – perfect for those seated by windows, allowing them to see both sides in comfort. In fact most do seated during the trip, which lasts two and a half hours, because they are served a delicious lunch by an excellent wait staff. I had tasty scallops, sea bass and a meringue desert, accompanied by a good Macon wine – as good an epicurean experience as I’ve had afloat for a long time. Finally, seek out the Lumiere film museum (institute-lumiere.org) a tribute to the Lyonnais brothers, pioneers in photography, who went on to invent the cinematographe, derivation of the word cinema, and showed it off to universal acclaim in Paris in 1895.